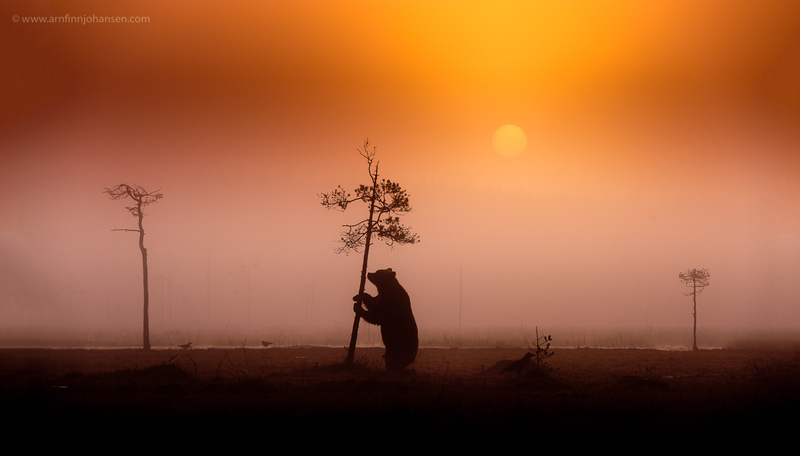 I am both glad, humble and of course proud, to announce that my photograph of Brown bear in early morning mist (image #1 below) taken in Kuhmo in Finland for about one year ago, has been awarded the Overall Winner of the Nordic Nature Photo Contest 2011! This image was also awarded as the main prize winner of the category Nordic Mammal Image of the year. 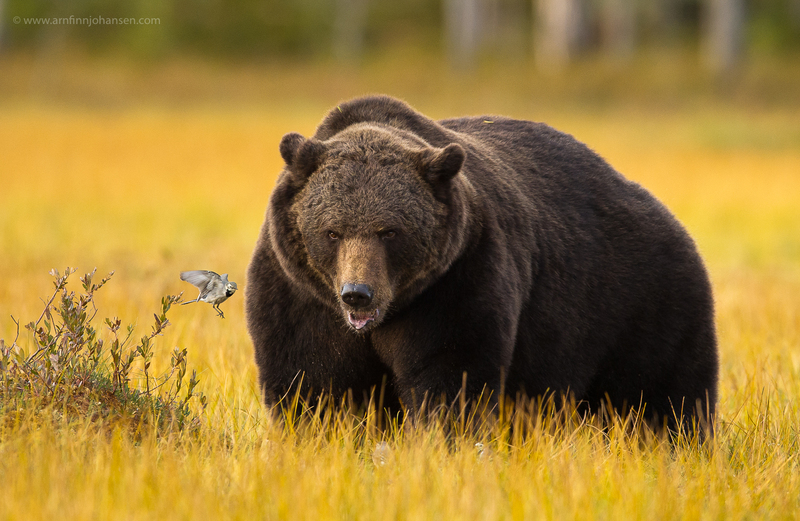 In addition I am flattered to announce that I had two highly commended images in this contest as well: An image of Wagtail and brown bear (image #2 below) was commended in the Nordic Bird Image category, and in the Threatened Nordic Nature category my image Wolf stare (image #3 below) was commended. These two photographs I have also taken in Kuhmo in Finland, near the Russian border. 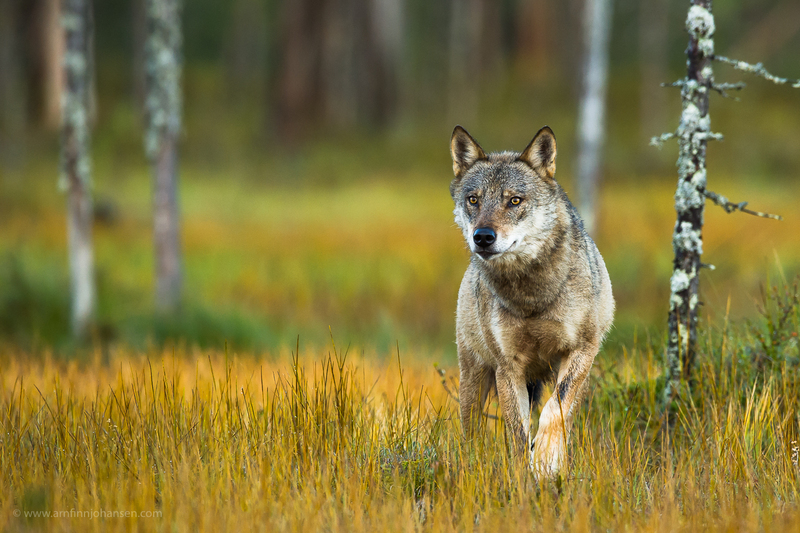 Thanks to Lassi Rautiainen for giving the possibilities for wild brown bear and wolf photography in the Finnish wilderness. The price ceremony was held at Natural History Museum at Tøyen in Oslo on 29th March, and at the same evening in the museums’ botanical garden an outdoor exhibition of all the award-winning photographers’ images were opened. The exhibition will remain open for two months. The yearbook with the award-winning images was also launched on this day. The Nordic Nature Photo Contest is organized by Natur&Foto Magazine. The contest is international and open to both professionals and amateurs. There are ten different categories, and 4,500 images were submitted. In addition to awarding the overall winner, The Nordic Nature Photographer of the Year, NNPC also awarding The Young Nordic Nature Photographer of the Year. This award was given to Halvor Klareng (17). For more information about NNPC and to see all the award-winning photographs, visit Natur&Foto at www.naturogfoto.no. Brown bear in early morning mist. Overall Winner of the Nordic Nature Photo Contest 2011 (NNPC). Nikon D3, Nikkor 70-200/2.8 VR, 1/400 sec at f/6.3. -2/3 EV, ISO 200. Wagtail and brown bear. Highly commended image in the Nordic Bird Image category in NNPC 2011. Wolf stare. Highly commended image in the Threatened Nordic Nature category in NNPC 2011. Nikon D3s, Nikkor 600/4 VR, 1/640 sec at f/5.6. ISO 4000. Hello Arnfinn!Really great and touching pictures. Your systematic and demanding way in taking photos brings us these uncredible pictures.And succes for You!Nice summer to You! Vinnerbildet ditt er legendarisk bra. Alt stemmer. Gratulerer – uten tvil vel fortjent! Utrolig bra. Det er sjelden jeg blir stum, – men det vet du jo. Hei Arnfinn. Utrolig fortjent og utrolig flott å se deg på tv, dette var tøft. Fikk linken til siden din ifra Maja, det er lenge siden nå gitt. Gratulerer – og vel fortjent! Gratulerer så mye! Bildene dine er helt fantastiske! 🙂 Du er nå et av mine forbilder! Utrolig samling av høykvalitetsbilder Arnfinn. Gratulerer så mye og fortsett i samme bane!! Gratulerer med et fantastisk flott bilde! Personlig er jeg enda et hakk mer begeistret for bildet av bjørn og meis.